Everyone knows the best part about a salad is the TOPPINGS! 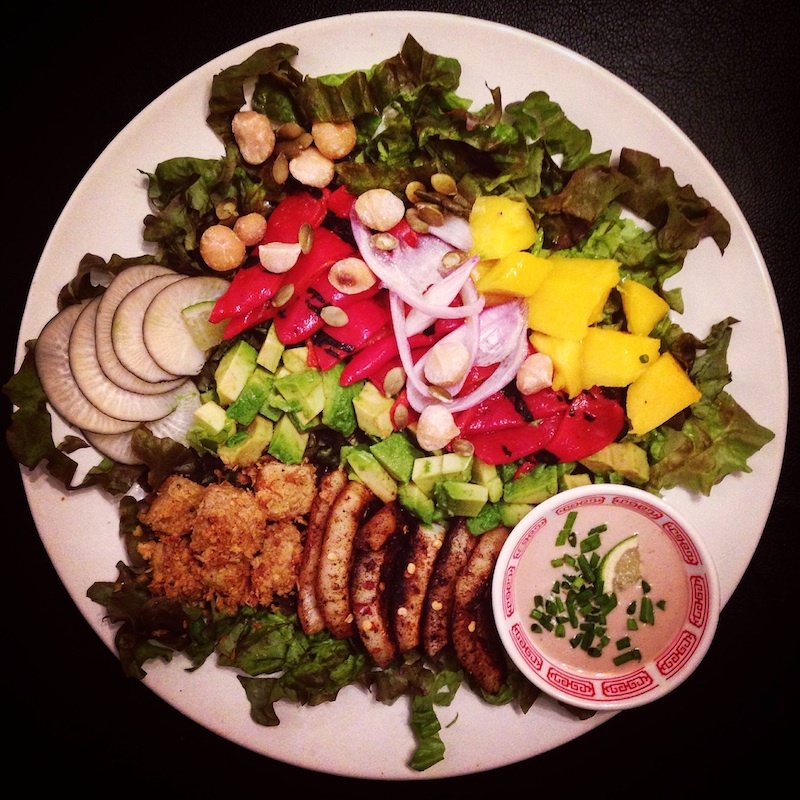 In my vegan version of the classic Chef Salad, I’ve updated the toppings to make funnest, most colorful and healthy dish that you will enjoy serving and eating. Wash and dry the lettuce. Roughly chop and spread evenly on four plates. Cube the mango and slice the roasted red peppers, shallot, and black radish and place on the bed of lettuce. Leave the avocado for last because you don't want it to brown! Squeeze any excess water from the tofu and cube. On a medium high heat, fry the tofu cubes in olive oil letting the sides get crispy. Start shaking the nutritional yeast flakes on every time you stir. Let the flakes coat the tofu completely. Remove from heat and set aside in a bowl to cool. On medium heat, toss the coconut chunks in olive oil, a dash of paprika and garlic salt. Let them get crispy on either side. When it is crisp to your liking, remove from heat, shake some red pepper flakes on there, and set aside in a bowl to cool. To make the dressing, mix the tahini, one tablespoon olive oil, balsamic vinegar, veganaisse, and the juice from half a lime in a bowl with a baby whisk. Add 2 cloves of finely chopped garlic, a couple sprigs of finely chopped chives, and mustard and continue to whisk. Start adding water until you reach your desired salad dressing consistency. Finally, cube the avocado and place on the salad with the tofu and coconut bacon. And just for FUN, toss a few nuts on top!